Ahmedabad city has been BJP’s impregnable bastion every since Narendra Modi became the chief minister of Gujarat in 2001. Nowhere is Modi’s Gujarat Model more visible than in Ahmedabad – both in terms of quality infrastructure as well as in terms of communal politics. Catch visited four such constituencies in Ahmedabad – Naranpura, Ellisbridge, Maninagar and Ghatlodia. To say these are BJP strongholds is an understatement. In the last election, BJP got over twice, in some cases even thrice as many votes than Congress in each of these seats. When it comes to Ellisbridge, the saying goes that even if the BJP were to field a Raavan, and Congress, a Ram, it will be BJP’s Raavan who would win--such is the popularity of the saffron party. The same stands true for Naranpura, which elected BJP President Amit Shah till he resigned and moved to Rajya Sabha, Modi’s seat Maninagar and Ghatlodia where Anandiben Patel won by a record margin. 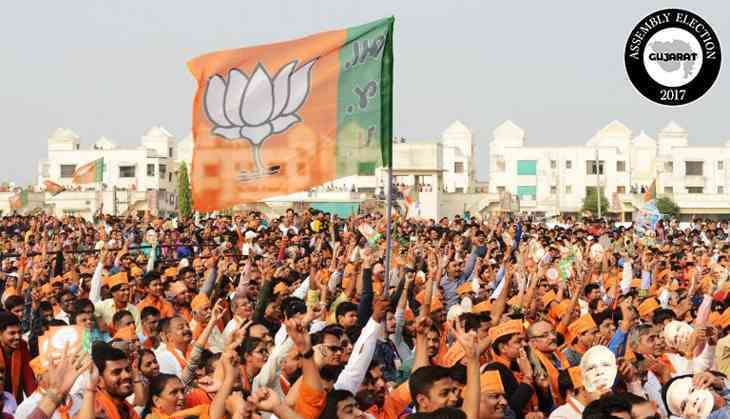 The saffron party won 13 seats in the last Assembly in Ahmedabad district. Will it be able to repeat its performance? “Is baar kuch mahaul badla badla sa hai,” says Hitesh Advani, as he made small garlands of white flowers next to the Dambeshwar Maharaj temple. In 2012, Amit Shah won it by over 60,000 votes. This time, the BJP has fielded Kaushikbhai Patel, who lost the 2007 polls in Shahpur. He will take on Congress’ Nitin Patel, another Patidar. Meanwhile, Advani continued with his observations. “The businesses were not doing well. First notebandi and then GST made it worse,” he explained. “Vikas has happened. But these factors also matter,” he believes. Young Patidar leader Hardik Patel’s massive roadshow across the city which travelled through nine Assembly constituencies, all won by the BJP in 2012. “This will also have an impact on BJP’s chances,” Advani says, as the Patidar convoy passed through Naranpura, comprising several motorbikes and cars, including a few Mercedes Benz. The young Patidars shouted “Jai Sardar, Jai Patidar” and ‘Jai Bhawani, BJP Jaavaani’ (Jai Bhawani, BJP is going). The anger against the BJP was on full display. “This is a BJP dog, that is why it is barking at us,” one remarked, as a pet dog, perhaps unnerved with the noise and the crowd barked at the roadshow. A few steps ahead, Chiragh Patel is upset. “This has been a BJP seat all along. 80% of Patidars would always vote the BJP,” he said. “But what Amit Shah did to the Patidar youth during the Andolan was not right,” he explained adding how that has caused serious disenchantment among the Patidar youth. “This time BJP should not expect our vote,” he said complaining how the media had blacked out Hardik Patel. “It only shows Modi,” Patel rues. “BJP Hindu ki party hai. Hum ne jitaya tha. Is baar nahi,” he says. Patidars could also play a spoiler in Ghatlodia, but to a lesser extent. Since Anandiben is not contesting, the BJP has fielded her confidante Bhupendra Patel, who also happens to be the Chairman of Ahmedabad Urban Development Authority. The Congress has fielded a rich realtor Shashikant Patel. The latter had lost to Amit Shah in Sarkhej in 2007 by over 2 lakh votes. But this time there are chances of a keen contest on the seat. “There will at least be a contest this time,” Parag Bhai Panchal, a Congress worker. The constituency has more than one lakh Patidar voters. Despite the belief that urban Patidars would not vote the Congress despite the agitation, Panchal says it is a wrong assumption. “Did you not see the crowd as Hardik’s rally passed by,” he asks. Even if 20-30 percent of the Patidar votes go to the Congress, it would make for an interesting contest. “Doklam and Pakistan are not going to appeal to people this time” Tushar Patel says referring to Modi’s speeches. “This election has become youth versus the rest,” he continues, explaining how education has become costly and how jobs still continue to elude. “The youth has seen 22 years of BJP rule. And they are angry,” he says. The Congress is also confident of putting up a fight because although its candidate lost in the Corporation elections, their vote share increased considerably. Like Naranpura, Maninagar, too, has been a BJP bastion with the party winning it in the last six elections. After Modi became the Prime Minister, Suresh Patel won the by-elections by over 49,000 votes. He is contesting again. His opponent is 35-year-old Shweta Brahmbhatt, an IIM educated and daughter of a senior Ahmedabad Congress leader Narendra Brahmabhatt. She also happens to be the only woman both major parties have fielded on the 16 seats that make up the metropolis. “This is BJP’s fort. Everyone is BJP here,” says Ramesh Bhai. “When Narendra Modi was our MLA, he changed everything. From the Kankar Talab, to the nullahs, everything was redeveloped,” he says. “Nobody has any complaints with the BJP,” Rakesh Bhai Patel, another local who runs a paan shop says. “People are upset about GST. It has made things difficult. But it is not enough a reason for us to desert the BJP,” he says. Given the huge margins BJP had last time, it seems highly unlikely that the Congress would be able to wrest these seats from the party, despite a swing in its favour.